Rugby League World Cup draw was held on Tuesday. The organizing committee (OC) has been named Australia and New Zealand of the 2017 Rugby World Cup as the host country. The tournament will be on screen on October 27 next year, which will run until December 2. At the opening match of 2017 world cup, England will play against Australia in Melbourne Rectangular Stadium. On the other hand at 28 October Host New Zealand will play against Pacific Samoa. next year’s Rugby World Cup 2017 final in December 2 will be kick off in Brisbane. 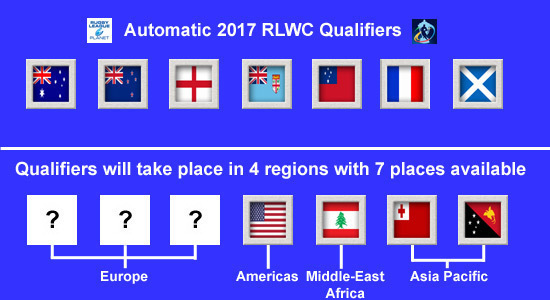 11 teams have already confirmed to take part in 2017 Rugby League World Cup event. Three more teams will take part in the World Cup. That is why Wales, Ireland, Russia, Serbia, Italy and Spain will be played to European qualifying tournament in October and November of this year to qualify themselves.